Given how successful this mahogany dreadnought is, I know I am not alone in hoping the OM-18 and 000-18 versions get released sooner than later! A neck shape exclusive to their new Modern Deluxe Series guitars. It is claimed to be inspired by the neck on the priceless the 1930 OM-45 Deluxe residing in the Martin Museum. The OM-28 Modern Deluxe is the only MD model thus far to have the traditional fingerboard width to go along with this vintage-esque neck shaping. So how close is it the genuine article? The day I first played that old guitar, I begged the people responsible for what gets made at Martin to put that neck on every OM they made thereafter. At the very least, I suggested, they needed to make it available on something less expensive than the $100K Authentic Series model based on that classic museum piece. Combining modern takes on vintage Martins with ultra-modern design specs, Martins newly announced Modern Deluxe Series breaks new ground by offering revved up versions of their Standard Series models with features previously only available on select Limited Editions. 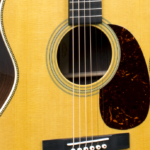 With the same tonewoods for the back, sides and top of the Standard Series, these Modern Deluxe Series models get Sitka spruce soundboards that have the extra benefit of Martin’s Vintage Tone System, their propriety torrefaction treatment, adding considerable depth to the voice of a brand new guitar that makes it sound “opened up” right out of the box. Unlike Standard Series Martins, these new models get top bracing made from Adirondack spruce with the VTS treatment. They are shaped with Golden Era style scalloping that removes more wood via carving angles different from the Standard Series scalloped bracing, allowing the denser Adirondack spruce extra flexibility and responsiveness while having greater stiffness along and across the grain compared to Sitka spruce bracing. This is a feature I have longed for on Sitka-topped Martins, particularly on the short-scale 000s. And while I was aware these guitars were approaching release, I did not know they were treating these Adirondack spruce braces with the Vintage Tone System! That had been previously reserved exclusively for the Authentic Series of high-priced vintage Martin recreations. Another vintage Martin feature is the use of natural protein glues, which bond with wood, and more deeply into it, for joinery even better than what is on most Martin guitars. This is also a new specification for Martin, as the glue on the Modern Deluxe models is different from the traditional animal Hide Glue they use on Authentic Series instruments. This new glue is derived from fish protein primarily, and is already being used elsewhere in the high-end guitar making industry. I have since learned that this new-to-Martin glue is being used to secure the top braces, but is not being used on the other joinery. 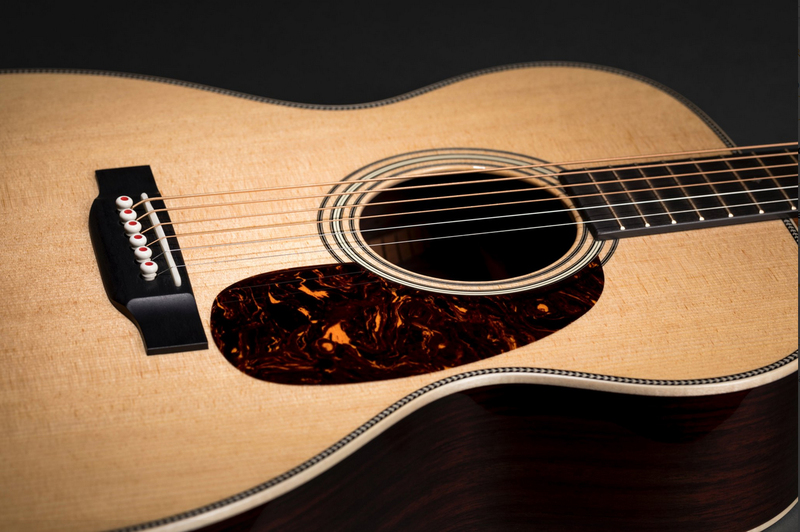 For the first time, Martin is using three ultra-modern Limited Edition specifications as standard features. A two-way adjustable titanium rod supports the neck with greater strength than a steel rod, but with less weight. And an ultra-light carbon fiber bridge plate, made from composite layers of wood and carbon fiber pressed together, contributes to an overall instrument weight closer to a vintage Martin, while reputedly increasing resonance as well. So too do the So I can relate to rooting for two closely connected rivals. bridge pins, which I have found to noticeably increase the initial sustain of fundamental notes. The Style 28 instruments show off flamed European maple for the binding, heel cap, and end piece, while Style 18 gets dark and woody Indian rosewood. All of the Modern Deluxe Series instruments get gold frets that are more sturdy than typical Martin frets, and the position markers and script logos are inlaid with colorful abalone. The 18s also get gold bridge pins with red dots, and the Style 28 bridges sport Liquidmetal pints what look like vintage red dot pins made of bleached white bone. The prototypes I have seen all have matching gold Waverly tuners. But the published spec sheets do not mention this, so the brand may be subject to change by the time they get to the NAMM show, which opens Thursday, January 24. Rather than having the apex of the carved profile running straight and directly at the center of the neck, with identical shaping on either side, this new neck shape is slightly asymmetrical, to fit the shape of the human hand in a more-natural way. Or rather, it is a new neck shape inspired by old Martin neck shapes from the 1920s and 1930s. This is special shaping was discovered in 2014, and I happened to be visiting my friends in the Martin Custom Shop offices the moment that discovery was made. Martin purchased at auction a priceless 1930 OM-45 Deluxe, and they were beginning to investigate it for their upcoming Authentic Series version of that rarest of vintage Martin guitars. After spending some 30 minutes with such a mouthwatering vintage Martin masterpiece, I had remarked that they should use that very neck shape for every OM they made from that day forward, as it was marvelously comfortable. So began the discussion of why and what made that neck different from other necks. It seemed to my hand that the apex of that V neck wasn’t directly centered, so the mass and grade of the slope on the bass (thumb) side and the treble (fingers) side were slightly different. But it was quite subtle and difficult to tell for certain. So, they had an employee fetch a proprietary gadget and took a convex mold from a section of the neck. To everyone’s surprise, I was correct. But no one was prepared for just how asymmetrical the factory workers had shaped necks at that important time in the Company’s history. And yet, once we saw the mold, it became quite obvious when in the hand. A 1931 OM-28 was sent for, and it had an even more extreme difference between the two slopes of the barrel, while having a similarly “skewed” apex. Martin applied this new knowledge in the making of the OM-45 Deluxe Authentic 1930. But to date, that $99,999.00 wonderment has been the only modern Martin to take advantage of this discovery – despite my repeated lobbying to the contrary. Now, at long last, they have applied that knowledge in the creation of the new Modern Deluxe Series, which feature the new neck shape they are calling the Vintage Deluxe profile. Most interesting to me is the fact they are using it in combination with their modern High Performance Taper, which narrows the width of the fretboard faster than on traditional Martin necks, giving the entire neck a faster, sleeker feel. The only new model that does not get the High Performance Taper is the OM-28, which has the Standard Taper, meaning it measures 2-1/4″ wide at the 12th fret, like actual vintage Martin OMs! And so the instruments in Martin’s oh-so-Modern Deluxe Series combine vintage Martin aspects with modern day know-how and high-tech advancements in a most exciting way. 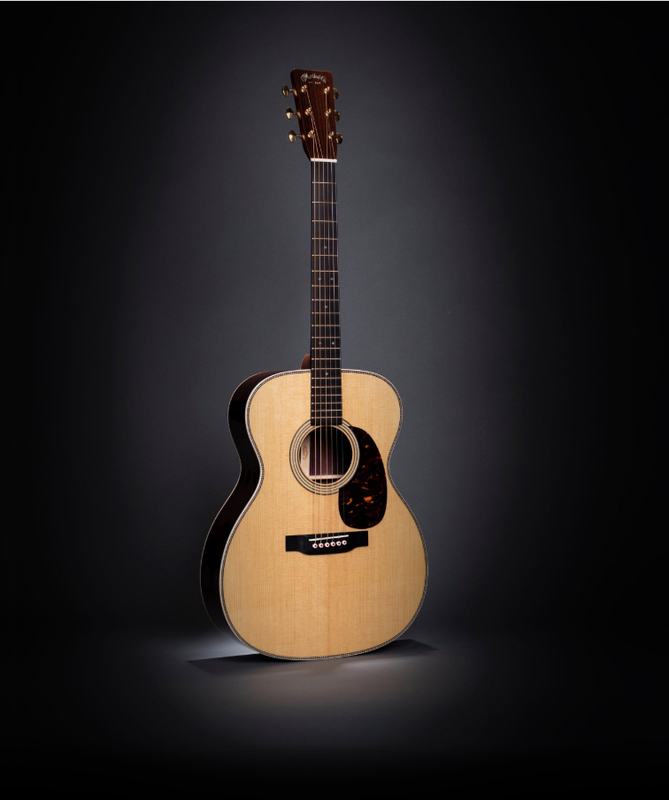 Select Specifications: Solid tonewoods throughout, including Indian rosewood back and sides, Sitka spruce top with scalloped 5/16″ Sitka spruce bracing; short-scale High Performance neck with Modified Low Oval profile, ebony fretboard with 1-3/4″ width at the bone nut, 2-1/8″ width at 12th fret; ebony bridge with compensated bone saddle, 2-5/32″ string spacing; Style 28 (2018) appointments including Aging top toner, herringbone purfling, Antique White binding, abalone Diamonds and Squares fret position markers, Style 28 back strip, chrome color open back Schaller GrandTune tuners. The written review of the new 000-42 (2018) all the rest of these new Martins will be published soon! This new D-41 (2018) and all the new Martins will have their written review published soon. I am putting out the video portions first this time around. The in-depth written review of the 000-28 (2018) will appear once I produce the videos of the various 2018 Martins I recorded at the Martin factory on NAMM Day 2018. The written reviews of all the new Martins will appear starting later this week. I am doing all the videos first for a change. The written review of this new Martin D-45 (2018) will appear after I produce the other Winter NAMM Martin videos. Stay tuned!